Each P3 Class has a Communications Team as part of the Harvest Appeal project that they are leading in school. They are working with Mercy Corps to raise money to help Syrian refugees. 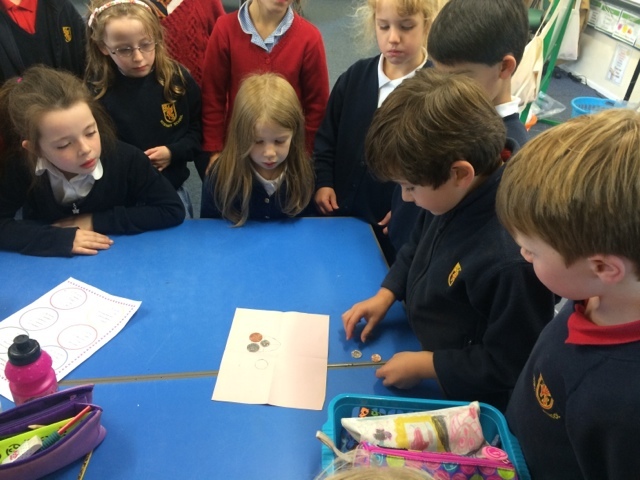 Comms Teams from P3A and P3C met with Mrs Noble and Ms Christie to make sure everyone hears about their appeal. The P3B Comms Team met with Ms Gallagher. Present: P3B Communications Group: Catie, Jamie, Izzy, Zoe, James. 1. What do we want to say about the P3 Project? 2. How can we tell people about the P3 Project? 1. Everyone explained the project in their own words to help tell other people about it. We have decorated envelopes and everyone will get one. Please put some money in your envelope and bring it back to school by 8th October. We will collect the envelopes from the classes. Everyone in P3 has a different job to do. Some people are envelope collectors, some people are money counters and some people are going to talk at Assembly to tell everyone about our project. 2. Everyone had great ideas about how to tell people about the P3 project. * Send an email to families. * Ms Gallagher will help the Communications Group to put up photographs and information on the P3 website. * The group are going to draw some pictures for the website. Jamie would like some other fundraisers this year, like the Swimathon, to help Syrian refugees. The Communications Group met yesterday. Everyone in P3 has worked really well together and got lots done really quickly! 1. What has P3 done so far? 2. What will the Communications group do next? What Has P3 Done So Far? * Email sent to families. Next week, the P3 Communications will capture what happens in the project. After the October holiday they will put their photos, notes, interviews and drawings on the website. * Everyone will use their booklets to write down notes. * Catie will ask Mrs Watson if the group can use their ICT time next week to type up some of their notes. * The group will write a list of pictures they want to take next week e.g. 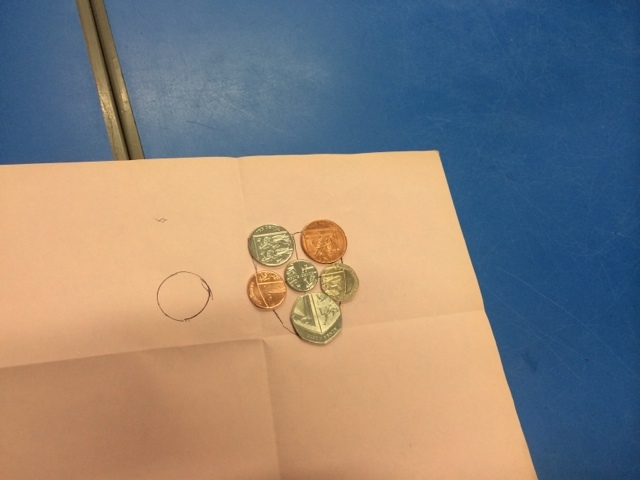 counting the money. * Izzy will ask Mrs Watson if the group can borrow some iPads to take photos a few times next week. * Take photos at the Assemblies next week on Friday 9th October. * Catie and Jamie would like to interview Victoria from Mercy Corps and Ms Anstruther. * Izzy and James would like to film the interviews. * James will speak to Ms Anstruther about displaying the total raised. * Ms Gallagher will help the Communications Group to put up photographs and information after the October holiday. * Jamie would like to put a message on our Digital Sign. At special Assemblies with Mercy Corps on Thursday 1st October, P3 pupils told the school about their Harvest project to help Syrian refugees. Envelopes should be returned to school by Thursday 8th October. Reuben had a wonderful discovery to share with everyone in P3a today. 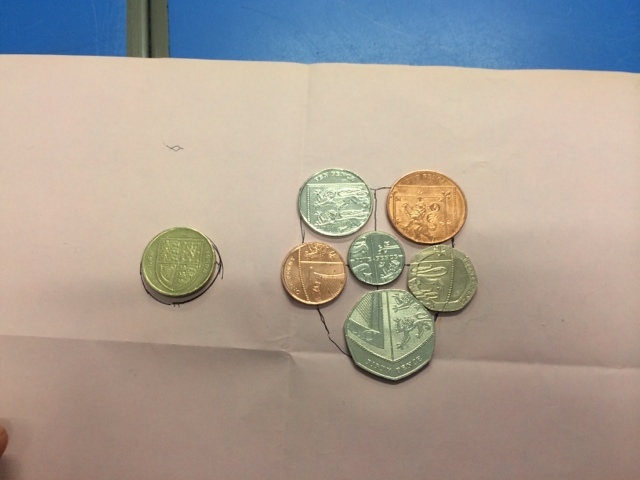 He found out that if you arrange all the coins they make up the shield of a £1 coin. Everyone was very impressed!